The Army adopts a new, classified set of interrogation methods that some feel may change the nature of the debate over cruel and inhuman treatment of detainees in US custody. The Detainee Treatment Act (DTA—see December 30, 2005), which bases its definition of torture in part on Army standards, is currently wending its way through Congress. The new set of instructions are being added to the revised Army Field Manual, after they are approved by undersecretary of defense Stephen Cambone. The addendum provides exact details on what kinds of interrogation procedures can and cannot be used, and under what circumstances, pushing the legal limit of what interrogations can be used in ways that the Army has never done before. Some military observers believe that the new guidelines are an attempt by the Army to undercut the DTA, and many believe the bill’s sponsor, Senator John McCain (R-AZ) will be unhappy with the addendum. “This is a stick in McCain’s eye,” one official says. “It goes right up to the edge. He’s not going to be comfortable with this.” McCain has not yet been briefed on the contents of the new guidelines. McCain spokesman Mark Salter says, “This is politically obtuse and damaging. The Pentagon hasn’t done one molecule of political due diligence on this.” One Army officer says that the core of the definition of torture—what is and is not “cruel, inhumane, and degrading” treatment—“is at the crux of the problem, but we’ve never defined that.” The new Army Field Manual specifically prohibits such tactics as stress positioning, stripping prisoners, imposing dietary restrictions, using police dogs to intimidate prisoners, and sleep deprivation. The new manual is expected to be issued before the end of the year. [New York Times, 12/14/2005] The day after this is reported, President Bush agrees not to veto the DTA (see December 15, 2005). During the Senate hearings to confirm conservative jurist Samuel Alito to the Supreme Court, the questioning turns to Alito’s views on the “unitary executive” theory (January 1, 1992). The theory seems to have originated in the Reagan administration’s Justice Department (see April 30, 1986), where Alito worked in the Office of Legal Counsel. Lawyer Testifies to Unitary Executive - Former Clinton White House counsel Beth Nolan testifies about the theory and its potential for dramatically revamping the power of the presidency: “‘Unitary executive’ is a small phrase with almost limitless import. At the very least, it embodies the concept of presidential control over all executive functions, including those that have traditionally been executed by ‘independent’ agencies and other actors not subject to the president’s direct control.… The phrase is also used to embrace expansive interpretations of the president’s substantive powers, and strong limits on the legislative and judicial branches.” Nolan cites a November 2000 speech by Alito to the Federalist Society, where Alito said in part, “the president is largely impervious to statutory law in the areas of foreign affairs, national security, and Congress is effectively powerless to act as a constraint against presidential aggrandizement in these areas.” [Dean, 2007, pp. 100-106] During the questioning session, Alito denies ever discussing the idea of inherent presidential powers during that speech. Evasive Answers in Hearings - Senator Richard Durbin (D-IL) says in his opening statement that he intends to press Alito on his support for what Durbin calls “a marginal theory at best… yet one you’ve said you believe.” Durbin notes that the Bush administration has repeatedly cited the theory to justify its most controversial policies and decisions, particularly in conducting its war on terror. Senator Charles Schumer (D-NY) adds: “The president is not a king, free to take any action he chooses without limitation, by law.… In the area of executive power, Judge Alito, you have embraced and endorsed the theory of the unitary executive. Your deferential and absolutist view of separation of powers raises questions. Under this view, in times of war the president would, for instance, seem to have inherent authority to wiretap American citizens without a warrant, to ignore Congressional acts at will, or to take any other action he saw fit under his inherent powers. We need to know, when a president goes too far, will you be a check on his power or will you issue him a blank check to exercise whatever power alone he thinks appropriate?” [Savage, 2007, pp. 271-272] However, Alito refuses to address the issue in the hearings, giving what one journalist calls “either confused or less than candid” answers to questions concerning the subject. Senator John McCain (R-AZ), the presumptive Republican nominee for president, urges President Bush to veto an upcoming bill prohibiting waterboarding and other extreme methods of interrogation after himself voting against the bill. The bill passes the Senate on a largely partisan 51-45 vote. It has already passed the House on a similar party-line vote, and Bush has already announced his intention to veto the bill. McCain has won a reputation as an advocate of prisoner rights and a staunch opponent of torture; his five-year stint as a POW in North Vietnam is well-known. But McCain voted against the legislation when it came up for a vote in the Senate, and he opposes the bill now. McCain says he is opposed to waterboarding, but does not want the CIA restricted to following the practices outlined in the US Army Field Manual, as the legislation would require. McCain says: “I knew I would be criticized for it. I think I can show my record is clear. I said there should be additional techniques allowed to other agencies of government as long as they were not” torture. “I was on the record as saying that they could use additional techniques as long as they were not cruel, inhumane and degrading treatment. So the vote was in keeping with my clear record of saying that they could have additional techniques, but those techniques could not violate” international rules against torture. 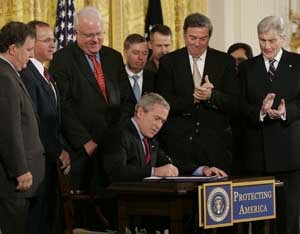 McCain has said he believes waterboarding is already prohibited by the Detainee Treatment Act of 2005 (see December 30, 2005). And CIA director Michael Hayden has said that current law may well prohibit waterboarding; he claims to have stopped CIA agents from waterboarding detainees in 2006, and also claims that the technique was not used later than 2003. McCain’s Senate colleague, Charles Schumer (D-NY) says that if Bush vetoes the bill, then he in essence “will be voting in favor of waterboarding.” [New York Times, 2/13/2008; Associated Press, 2/21/2008] Bush will indeed veto the bill (see March 8, 2008).